Potholes in Asphalt: What Causes Them and How are They Fixed? The damage of Wisconsin winter is starting to show – especially on the roads. As the weather warms up, road construction starts up again in the Madison and Milwaukee areas. With road construction, comes pothole repair. Potholes form as a result of expansion and contraction during freeze-thaw water cycles, combined with the amount of traffic on the pavement. Potholes often appear in late winter and early Spring because of changing temperatures. The constant freezing and thawing of melting snow, combined with Spring rain, weakens the pavement and leads to cracks and potholes. Winter is prime time for asphalt damage, especially in cases of repeated melting and freezing. These can quickly cause eggshell cracks or potholes to occur. For the best results, asphalt patching and paving should be done in warmer weather. 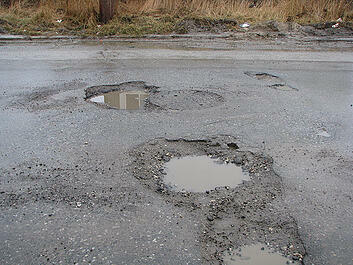 You can learn about the five reasons potholes should be repaired in spring in our blog. While asphalt repair is difficult in winter, it can be done. If your driveway or roadway is presenting a public safety hazard, you may have no other choice. If pothole repair cannot wait until spring, cold mix asphalt can be used to patch potholes. Cold mix asphalt is more workable in colder weather than hot or warm mix asphalt. Cold mix is produced by mixing bitumen emulsion or cutback with cold aggregates, sometimes also with the addition of anti-stripping agents. Cold mix asphalt has been used in the past as temporary patching material, or if hot mix asphalt is not available. That it can be used at low temperatures. That it can also be put in stockpiles for six months or so after production. That it remains more flexible than hot mix because of the extended cure time. At Wolf Paving, we produce and stockpile this mix to sell for maintaining streets and filling potholes in the winter months when the hot mix is not available. The mix of aggregates is very similar to that of hot mix, it just has additives that keep it workable in cold conditions. Watch this video to learn more about the cold mix asphalt manufacturing process. 1. How do potholes form? Understand the process. Potholes are caused by the expansion and contraction of water after it has entered into the ground under the pavement. As the weight of cars and trucks pass over the weak spot in the road, pieces of the pavement weaken, which causes the material to break down from the weight, creating the pothole. To learn more about the complete process in detail, download our free brochure Understanding the Pothole Process. 2. What do you use to patch potholes? Understand the mix. Potholes come in all shapes and sizes and your pothole repair mix should, too. In fact, the quality of the asphalt mix used to repair your pothole makes a big difference in the aesthetics and durability of your pothole repair. At Wolf Paving, we are proud to own the materials and plants, which allows us to control the entire process and provide you with the highest quality custom asphalt mixes to meet your specific paving needs. We have developed numerous custom mixes to ensure the right asphalt mix every time. Take a look at our video on the cold mix asphalt process, from start to finish. 3. How to fix potholes in roads? Understand the basic process. Clean the pothole. Dirt and debris that can get in and under the pavement needs to be removed. Having pieces of broken pavement mixed in with the new pavement can weaken the repair. Heat the pothole. Heating the hole removes any extra moisture that may be in the existing pavement and also softens the area so the new asphalt can be applied. The pothole hole can also be reshaped once it is softened and old asphalt can be removed or rejuvenated. Add the new asphalt. Typically, hot mix asphalt is used for this repair. The asphalt needs to be compacted after applied to ensure the reduction of water penetration and increases its resistance. The compaction creates a bond between the old and new asphalt pavement. Allow the new asphalt to cool. Any debris left around the repair is removed. Most pothole repairs can be driven on immediately. 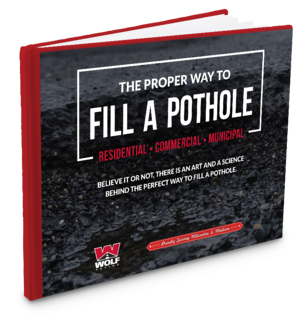 For more in-depth information, download this FREE eBook, How to Properly Fill a Pothole, to learn the full pothole repair process. 4. Who fixes potholes?? Finding a pothole repair company or asphalt contractor. Believe it or not, there are specific qualities to look for in an asphalt paving contractor. The first step is to do your research. Ask a lot of questions and understand the contractor’s level of experience, their customer satisfaction rate and the process they use to repair asphalt pavement and potholes. It is important to get multiple quotes and always ask a contractor for references and referrals from the past 12 months. The quality of your pothole repair and the length of time your repair will last depend a great deal on the experience of your contractor and how they complete the repair process. Have a pothole in your driveway, road, or parking lot that needs fixing? Get a free project estimate here. It's possible that collision coverage on your insurance policy will cover sudden damage done to your vehicle caused by a pothole. Insurance will not, however, cover everyday wear and tear caused by driving over pothole-covered roads over a longer period of time. 1. Keep your eyes peeled. Constantly scan the road and be aware of what’s in front of you; put the phone down. 2. Keep a safe following distance. You don’t know how the driver in front of you will react if he/she sees a pothole. If you keep a safe following distance, you’ll be able to brake safely and have a better view of what lies ahead. 3. Don’t swerve. While swerving may feel like the right thing to do, it could put you in more danger. You could veer into the oncoming lane of traffic or cause your tire(s) to hit the pothole at an angle that could result in more damage. If you can’t safely avoid it, gently brake before the pothole, release the brake at the pothole and take it head-on. 4. Watch your speed. If you’re driving on a road that looks like it’s been in a war (and you know what I mean! ), slow down. If the road is bad, consider finding an alternate route. Pull over and check the map on your smartphone or the good old paper map in your glove compartment. 5. Watch out for water. Large potholes can collect water from a nearby snowbank and rain, making it hard to know how deep the pothole really is. Looking for more information on how to protect and repair asphalt roads, parking lots, and driveways? Visit our Everything You Need To Know About Asphalt Paving resource page to get your questions answered. By maintaining our own quarries and manufacturing plants, Wolf Paving is committed to contributing to and improving Wisconsin's roads, safety, and environment. Do you know a road, driveway or parking lot in need of repair? Request a free estimate and get on our list for upcoming projects! Contact Wolf Paving today, for the Milwaukee area, call us at 262-965-2121. For the Madison area, call us at 608-249-7931.